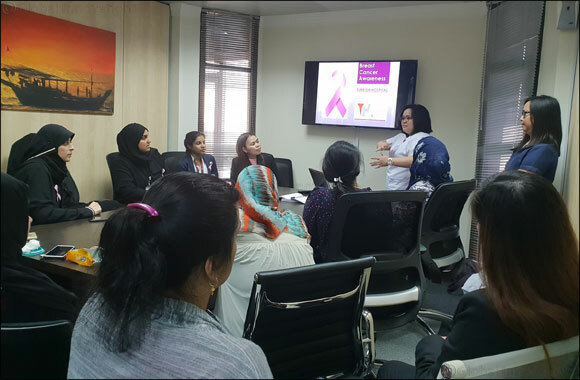 Doha, Qatar, October 31, 2018: Qatar Insurance Group, the region’s leading insurer recently conducted a Breast Cancer Awareness forum to increase medical awareness of breast cancer and highlight the importance of its early detection amongst its female workforce. Themed as The Pink Month campaign, the month long campaign kicked off with distribution of a pink awareness ribbon coupled with awareness presentation by the medical team to educate female staff about the risk factors, FAQs, its prevention and early screening methods that can save lives. Qatar Insurance Group is very proud to support such awareness initiatives for the well-being of the community. It demonstrates our Human Resources department’s ongoing commitment to raise awareness for the wellbeing of our community, and shows our support for those affected by it. As the leading insurer, we are very keen on promoting medical awareness and encouraging the adoption of a healthy lifestyle to reduce the risks of developing many critical diseases. As part of QIC Group’s Corporate Social Responsibility (CSR) activities, we always exert efforts that benefit and provide value.